Many times you need to attach several documents with products to provide your customer an ease to use the product. Since it is more important to provide necessary details to your customers who are about to purchase your product. But the question is how to provide your customer an attachment block on the product page? here we are having the solution for this problem —-> Odoo Advance Website Product Attachments this module will Associate Text Files, User Guides, pdf, etc, with your products which will be displayed on the website and can be downloaded by your customers. With this module, you can easily associate files with products which make it easy to include user guides, software downloads, and other digital content that might be associated with the product you are selling. The download count of an attachment is also recorded. Provide feature to add/show multiple attachments on the website. Associate Text Files, User Guides, pdf, etc, with your Products. Customers Can Filter Attachments by Category on the Frontend. View the Download Count for Each File Attachment. Change attachment category sequence on Website. Custom File Name, Title, and Descriptions. After buying this app from our Webkul store you will get the link for downloading the zip file. Simply download it and extract then you will see the advance_product_attachments folder, now you will have to copy this app folder inside your Odoo addons path. 3. Remove the app’s filter and search for the advance_product_attachments key. Firstly you need to enable Multi-attachments option from Website>>settings. 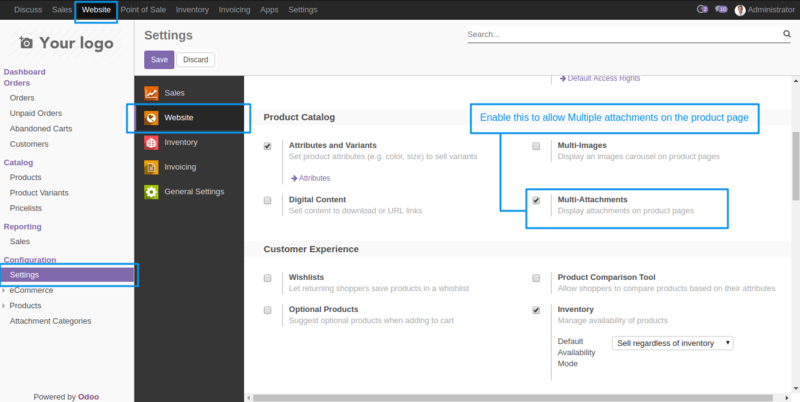 This will allow you to display attachments on a product on the website product page. You can also create several attachment categories from Website>>Configuration>>Attachment Categories. Not only you can create a category but also with simple dragging you can define the sequence of these categories and accordingly they will be displayed on the website. In the attachment wizard, you can define the name of the attachment added and upload the file. You can also select the attachment category as per the file demand and select the allowed user. On the description field, you can add details of the file uploaded it will be displayed on the hover of the mouse on the product page. Attachments displayed on the website. Attachment description on mouse hover.